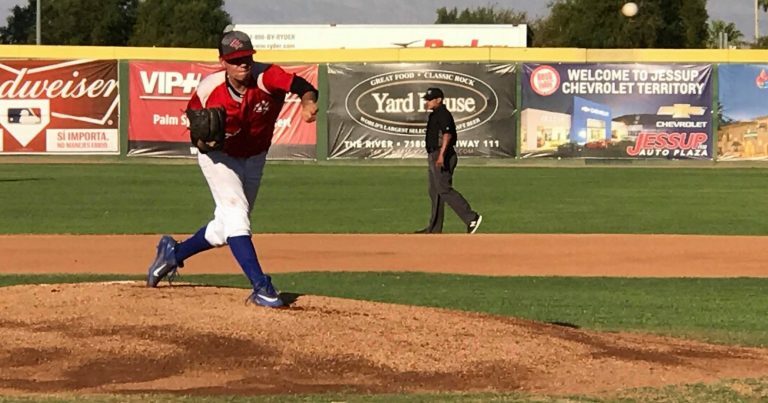 PALM SPRINGS, Calif. ~ The POWER and Palm Springs Collegiate League All-Stars put on a show in front of most of the city of Palm Springs this evening, with the POWER claiming victory 9-6 after eight innings. Grand Canyon University lefty Jake Repavich tossed four innings, striking out five and allowing four hits, including a towering solo home run from Lewis & Clark University outfielder Tyler Williams. The PSCL All-Stars kept up with the POWER throughout the game, taking leads in the second and sixth innings. The sixth would be the most trying inning for the POWER, with pitcher Jacob Corn (Spartanburg Methodist) running into trouble following some bad defense, a double and a walk. Naithen Dewsnap (Cal State Bakersfield) came in and after a throwing error on a pickoff attempt allowed a run to score, he struckout Jefferson College’s Dalton Doyle to end the inning. The POWER would come back in a big way in the seventh, with a four-run outburst that would be the difference in this game. Three extra-base hits from Brady Shockey (USC), Matt Green (St. Mary’s College) and John Mauldin (University of New Orleans) would help in the big inning and secure victory for the POWER. The game ended in eight innings due to the traditional 4th of July Fireworks Show at Palm Springs Stadium commencing at 9:15 PM. The POWER are off tomorrow but return to action on Friday, as SCCBL action continues against the Riverside Bulldogs. Gates will open at 6 PM, with first pitch at 7:05 PM.